In the forties and fifties North Lamar � which was not yet a part of Austin and was still known as the Dallas Highway -- was a well-known roadway lit up by nightclubs. The Skyline Club was a large club that opened on the Dallas Highway in 1948. It was was later given the address of 11306 North Lamar Boulevard, which is approximately the location of the Eckerd Drugs at North Lamar and Braker today (Page 24, The Austin American-Statesman, 09-07-2000). ). Johnny Horton, while still almost an unknown, had met and befriended Hank Williams. In 1960 Johnny Horton, now famous for such songs as �Battle of New Orleans� and �Sinking of the Bismarck� had � according to members of his band--been having premonitions of death. He had claimed that he felt he was going to be killed by a drunkard. On Friday night, November 4, Johnny Horton had a gig at the Skyline Club on Dallas Highway. He avoided the bar, because of his stated premonition that he was going to die in that very place. After the gig the band loaded their equipment into Horton�s white Cadillac and left the Skyline. It seemed that Horton�s premonition was not fulfilled. Horton was driving toward Shreveport, where he had just purchased a house. At the town of Milano, east of Austin. Horton�s Cadillac approached a bridge over a train trestle, a truck coming from the other direction hit one side of the bridge, then the other side, then it struck Horton�s car. The driver was found to be drunk and had liquor in the truck cab: Horton was indeed killed by a drunk. 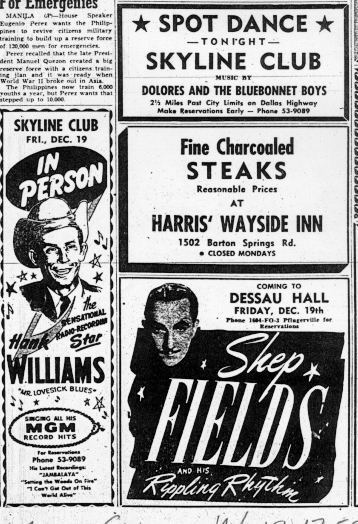 Like Hank Williams, a gig at the Skyline had been his last, and like Hank Williams, Horton left behind a grieveing widow named Billie Jean. Horton had married Billie Jean Jones, the same woman who had been widowed by Hank Williams.